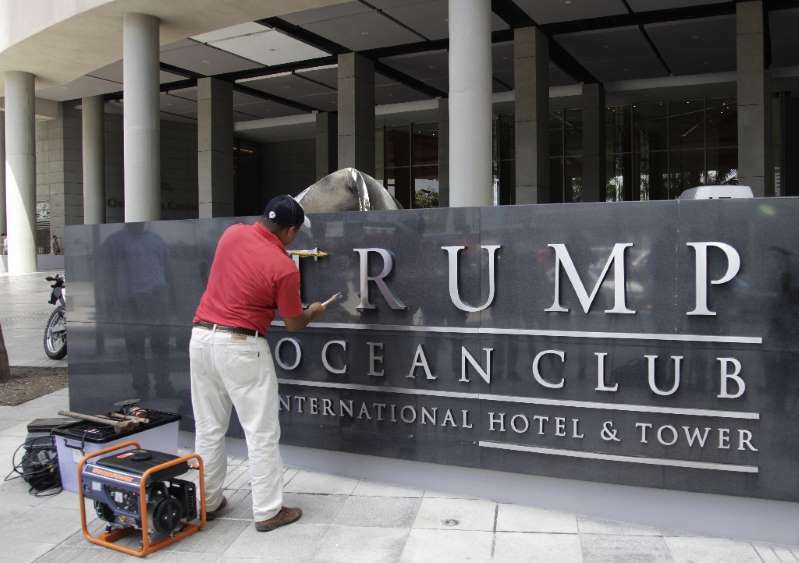 © Provided by AFP A man removes the sign from the former Trump Ocean Club ijn Panama City on March 5, 2018. "Marriott International takes control as of today, managing the building in all aspects," Demetrio Maduro, general manager of the new JW Marriot Panama City, told reporters. Until recently, the Trump Ocean Club International Hotel was located in the building, managed by the US president's property company, the Trump Organization -- now run by his sons. But last year, the hotel and most of the apartments in the tower were bought by Miami-based Cypriot businessman Orestes Fintiklis, who in March evicted the Trump Organization before its management contract had ended. Blaming the Trump name for a drop in business, he expelled the management company from the building and removed the president's name from the front of the luxury 72-floor high rise, triggering a flurry of retaliatory legal action. The Trump firm has launched legal proceedings to regain control of the hotel, which cuts a distinctive sail-shaped figure among the towers crowding the capital city. Inside are more than 1,000 rooms, apartments, shops, a spa and a casino. It even has a small private beach. The hotel was inaugurated in 2011 by Trump in the company of Panama's then-president Ricardo Martinelli, who is currently serving a prison sentence for spying on opponents. "Marriot took it over because it's an iconic building in Panama City and the important thing is to make it grow as a tourist destination," said Maduro, the new general manager. Fintiklis said he was delighted the running of the hotel was being taken over by Marriott, but declined to comment on the still simmering dispute with Trump. Lawyers for the Trump Organization lobbied Panama's President Juan Carlos Varela to use his influence to resolve the long-running court case, but the government ruled out interceding in the dispute.